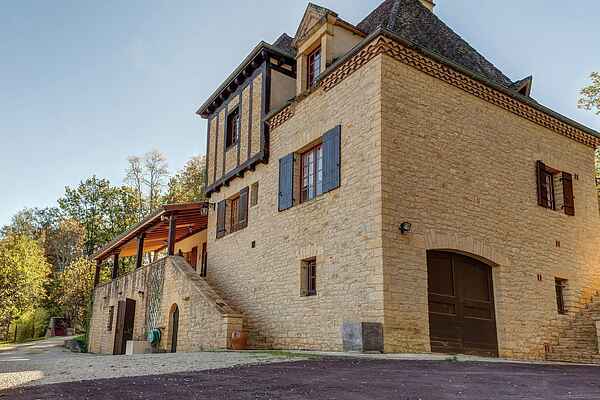 This free standing holiday home is located on a hill in the heart of the Dordogne, nearby Calviac-en-Périgord (6 km) You'll probably spent most time in the sunny garden with rose flowerbeds and adjacent forest. The children will entertain themselves on the playground, in the sandbox or in the heated pool. The kitchen is fully equipped, and comes with a Senseo coffee machine and an American fridge/freezer combination. The upstair bedrooms look out over the village of Carlux. Sarlat-la-Canéda (14 km), 'Pearl of the Périgord,' is a real tourist attraction. Stroll along the many timbered houses, through the tiny streets and across the charming courts. In Souillac (15 km) you'll find, amongst other things, an amusement park and a cute beach along the Dordogne. At Rouffillac (3 km) you can rent canoes to explore the river by water. The magnificent castles at Castelnaud-la-Chapelle (24 km) and Beynac-et-Cazenac (22 km) are definitely worth a visit. These castles are also visible from the water. This region is also famous for its prehistoric relics. You can visit old cave dwellings that belonged to the Cro-Magnons in La Roque Saint Christophe (40 km).